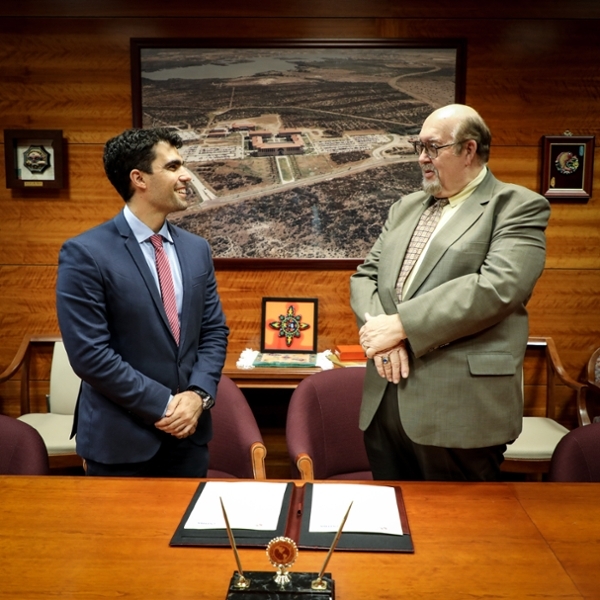 Luciano Fucello, representative of the Instituto Tecnológico de Buenos Aires (ITBA) visited Texas A&M International University (TAMIU) for the first time. 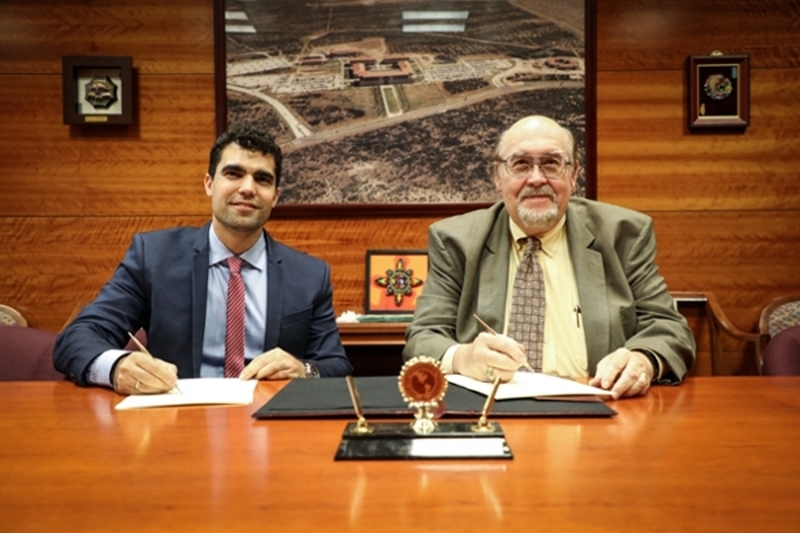 Fucello met with President Dr. Pablo Arenaz and a Memorandum of Understanding was signed to establish a research collaborative between the two institutions. 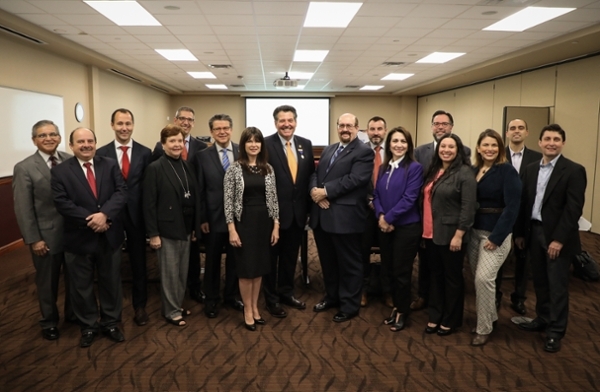 TAMIU President Dr. Pablo Arenaz and the Office of Global Initiatives hosted a luncheon for the new Technology and Socioeconomic Innovation Center of the City of Nuevo Laredo and their partners from Basque Country, Tecnalia. Dr. Arenaz and Maria Eugenia Calderón-Porter, Asst. VP for Global Initiatives received the group, which included the Mayor of Nuevo Laredo Enrique Rivas and Mayor of Laredo Pete Saenz, as well as Dr. José Daniel Covarrubias, Director of the Innovation Center of Nuevo Laredo, Jose Luis Elejalde, Director of Technology Services of Tecnalia, Iñigo Ugarte from Tecnalia, and Asier Maiztegui, Director of North America for Tecnalia among other community special guests. 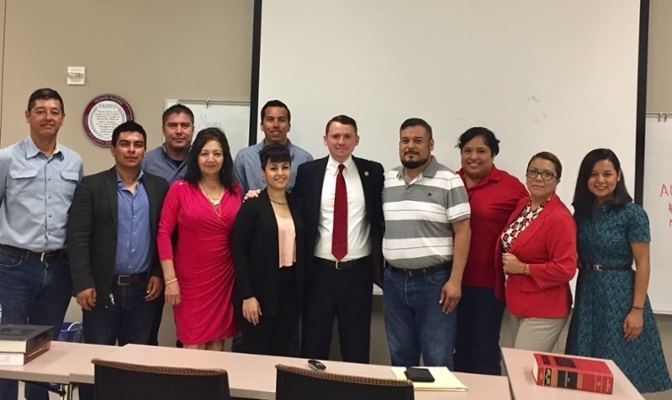 The Office of Global Initiatives hosted the signing of a Memorandum of Understanding between the Mexican Consulate General in Laredo, Texas and local nonprofits that support Mexican citizens by providing financial counseling. 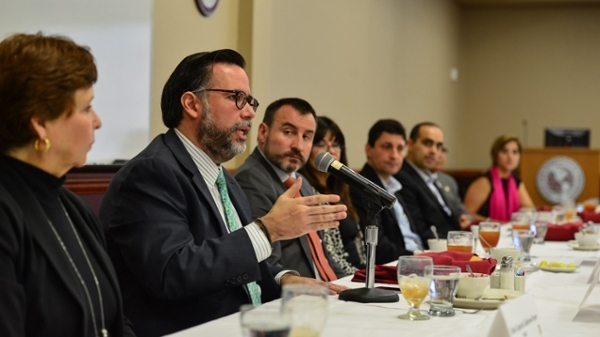 the Office of Global Initiatives hosted the first analysis of the sate of our border event. 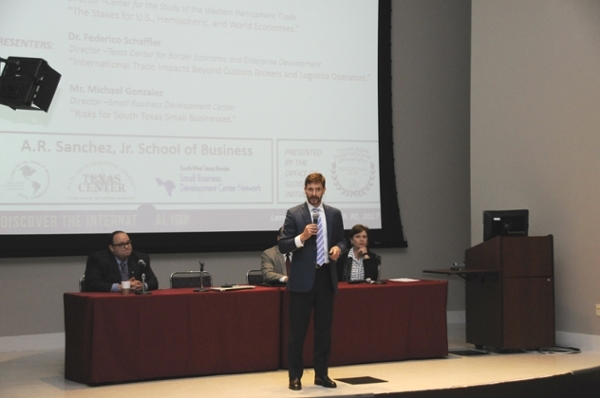 The presenters included Dr. Stephen Meardon, Director of the Center for the Study of the Western Hemispheric Trade; Dr. Federico Schaffler, Director of the Texas Center for Border Economic and Enterprise Development; and Mr. Michael Gonzalez, Director of the Small Business Development Center. Presentations available here. 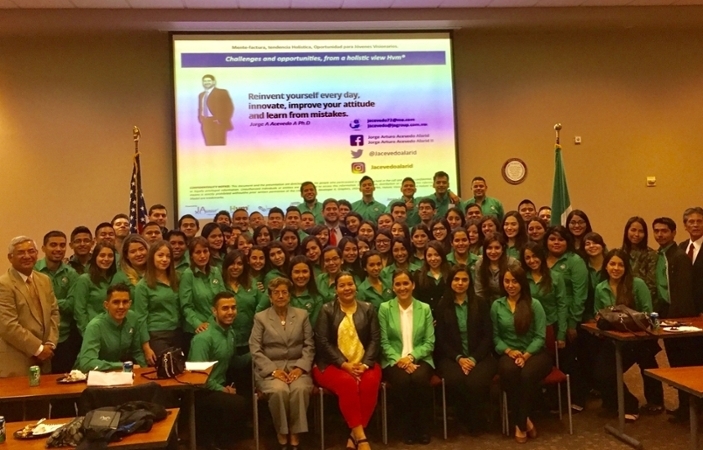 The Office of Global Initiatives hosted a group of Industrial Engineers from the Instituto Tecnológico de Nuevo Laredo. The day's presenters inlcluded: Maria Eugenia Calderón-Porter Asst. VP for Global Initiatives, Dr. Rafael Moras from the University of St. Mary's, Dr. Jorge Arturo Acevedo Alarid, from JAGroup and Dr. Daniel Covarrubias Peña, Director of the Socioeconomic and Technological Innovation Center of Nuevo Laredo. 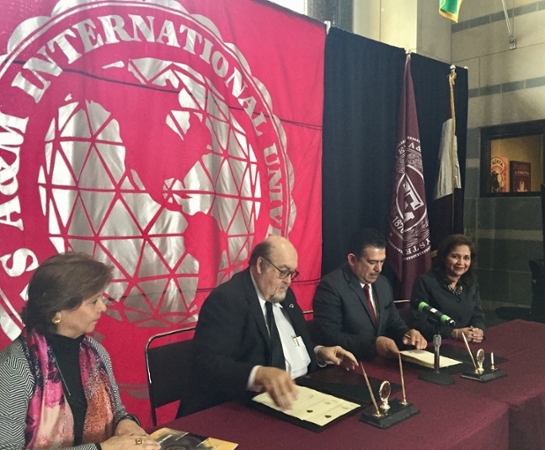 Dr. Pablo Arenaz, President of TAMIU and Mrs. Maria Eugenia Calderón-Porter, Assistant VP for Global Initiatives travelled to Mexico City to sign a memorandum of agreement with the Instituto Politécnico nacional de los Estados Unidos Mexicanos. The Office of Global Initiatives and the Department of Psychology and Communications from Texas A&M International University hosted the MOA signing with Universidad del Norte from Barranquilla, Colombia. Representing UNINORTE was Dr. Alberto De Castro, Dean of Humanities and Social Sciences, and Dr. Jesus Antonio Arroyave, Coordinator of the Communications PhD program. 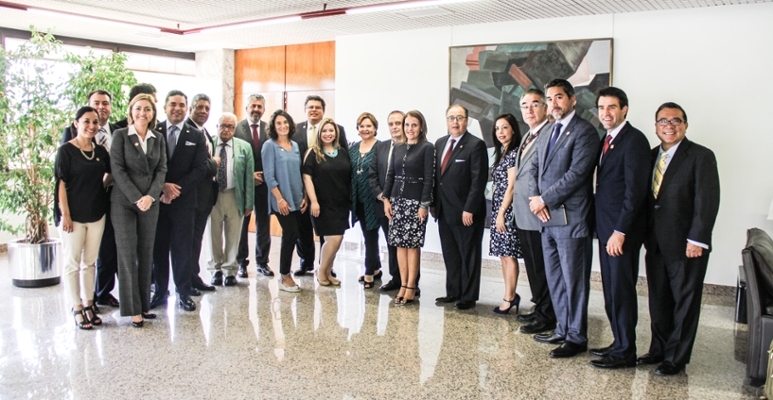 The Office of Global Initiatives hosted the inauguration of the Heritage Protection and Financial Advisory office of the Mexican Consulate General. Consul Carolina Zaragoza was present during the ribbon cutting ceremony. 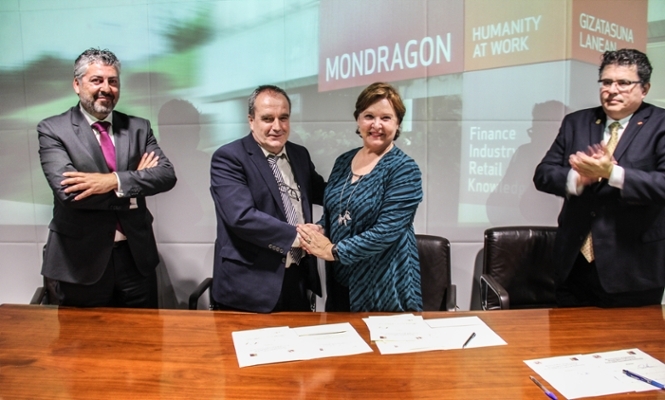 Dr. Pablo Arenaz, President of TAMIU, Mrs. Maria Eugenia Calderón-Porter, Assistant VP for Global Initiatives, and Dr. Steve Mon Dragon, Fellow of the Office of Global Initiatives attended the signing of the memorandum of agreement with Mondragon Corporation in Bilbao, Spain. 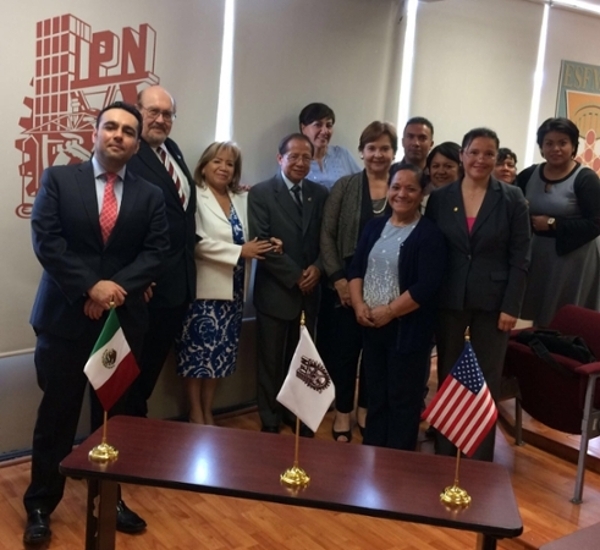 The Office of Global Initiatives and the International Language Institute (ILI) hosted a group of 10 law and criminology professors from the Universidad Autónoma de Nuevo León in Monterrey, Mexico, for a week-long intensive program on teaching techniques and specialized English for attorneys. 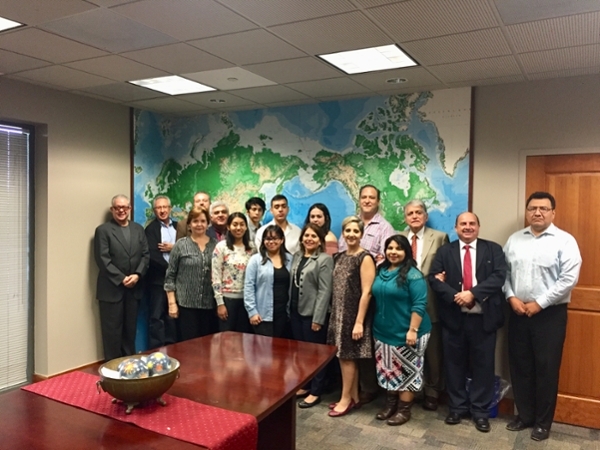 Dr. Carlos Ronderos, Director of Regional Development of the World Trade Center for Latin America and Dr. Martin Salloum, General Director of the World Trade Center for North America visited the Office of Global Initiatives. 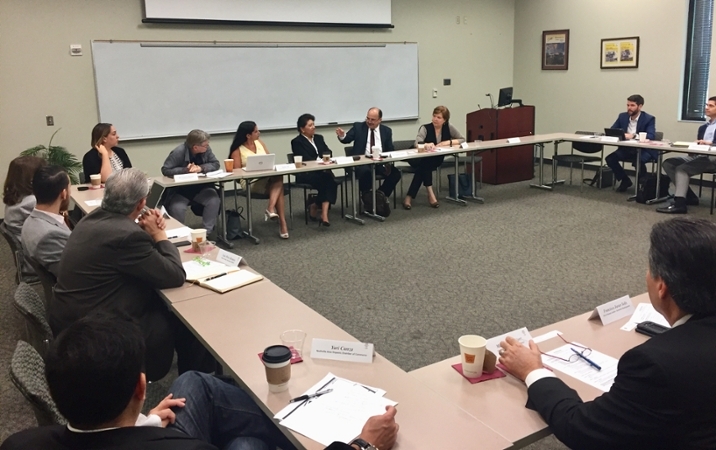 Presentations were made by Office of Global Initiatives the City of Laredo and the Laredo Development Foundation. 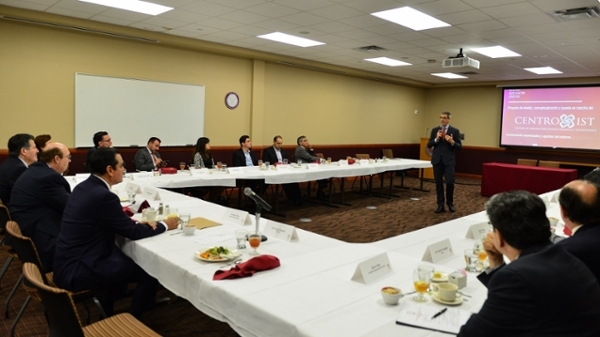 The Office of Global Initiatives along with the Texas Center hosted a #OneBorder Meeting, in which members and guests were received on campus for a meeting and conference focused on bringing “together individuals, organizations, and communities of the U.S. and Mexico border to strengthen our shared goal of security and prosperity and to deepen our bonds of friendship” (#OneBorder Coalition's mission statement). 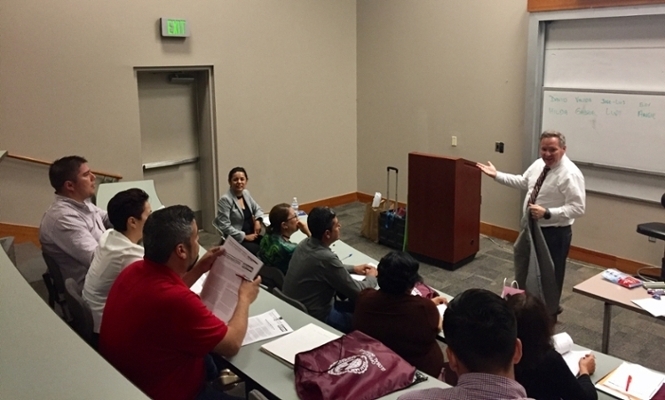 The Office of Global Initiatives hosted a total of 50 Computer Systems Engineers from the Instituto Tecnológico de Nuevo Laredo for a day of presentations at TAMIU. 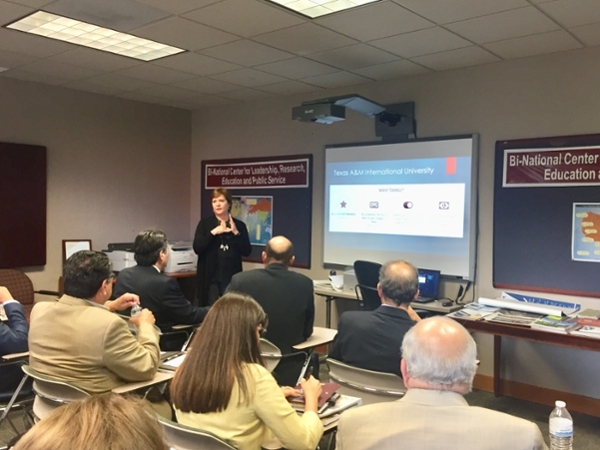 Presentations included the Department of Instructional Technology and Distance Education Services, Graduate Studies, as well as others. 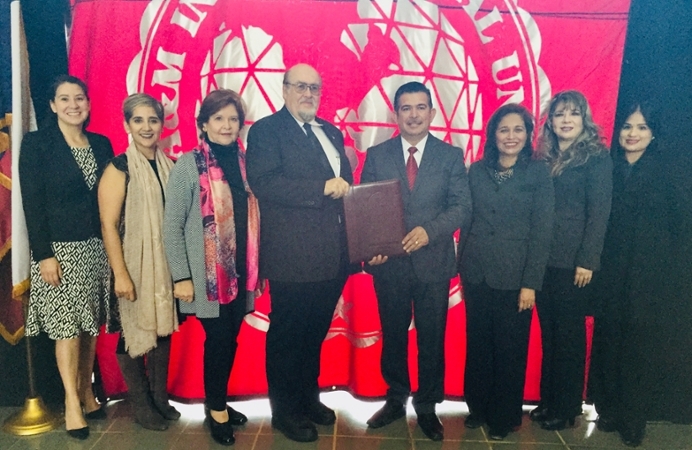 The Office of Global Initiatives hosted the signing of the memorandum of agreement with the Instituto Central Coahuila (ICC), a high school from the state of Coahuila in Mexico. The ICC will be working with the International Language Institute to send their students to learn English at our campus.